The Hipparcos satellite measures the distance to stars the same way a surveyor measures the distance to your property line. It takes readings from different angles plus the distance of the baseline between the angles, then uses these to calculate how far away the object is. Since its launch in 1989, the Hipparcos satellite has calculated distances to 100,000 stars more accurately than any other astronomical instrument. Most of Hipparcos' observations of individual stars agrees with previous distance calculations (where available). The notable exception to that rule is the familiar star-cluster in the constellation Taurus called the Pleiades (see photo above). Hipparcos measured the distance to 50 of the brightest stars in the Pleiades and came up with a distance of 118 parsecs from Earth. Previous distance measurements converged around the value of 132 parsecs. That's a significant difference; about 12%, or almost 3 quadrillion miles. The older measurements were re-examined, but they still produced the same 132 parsecs distance. What is happening here? 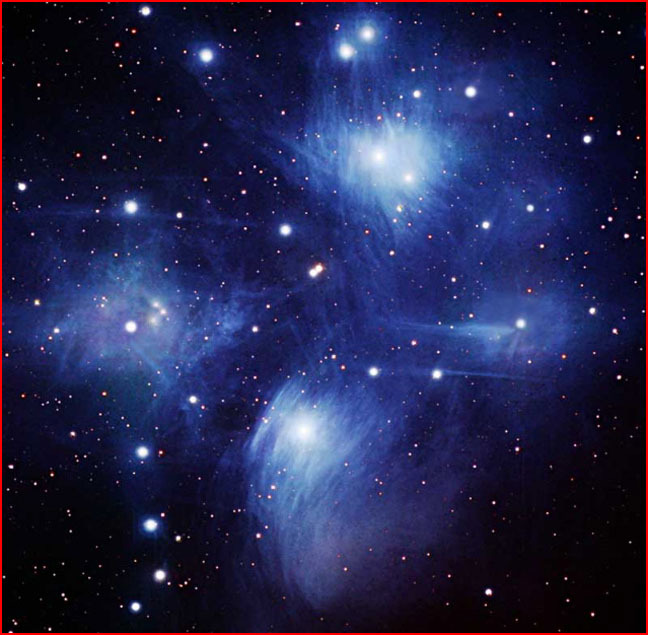 Why is there a discrepancy in the Pleiades' distance, but not in the distances of single stars? All of the older methods of determining the distance to the stars involve assumptions based on either the theory of nuclear stars or the theory of gravity (or both). But from an Electric Universe point of view, stars are powered by galactic electric currents, not nuclear furnaces. And gravity isn't a constant, but a variable dependent on electrical characteristics. The question we need to ask is how the electric currents of a cluster of stars are different from those of single stars. With many stars to share a current, will the individual stars seem brighter or dimmer than their non-clustered neighbors? Will the double stars in a cluster orbit each other under the influence of a different gravitational constant? The stars of the Pleiades also have a different metallicity (amount of materials heavier than hydrogen and helium) than nearby single stars. This is interpreted conventionally as the cluster stars being younger than their neighbors. But metallicity may be related to electric currents as well as (or instead of) age. This discrepancy in the calculations of how far away the Pleiades are may also cast light on the cosmological question of redshift. In his book, Seeing Red, Halton Arp has shown physical connections between galaxies and quasars of different redshifts. The higher redshift objects are smaller and fainter and appear to be younger. He also showed that this excess of redshift in younger objects applies to a smaller extent to stars -- bluer, hotter stars have higher redshifts than redder, cooler stars. Can the Pleiades distance problem offer insight about these larger cosmological questions as well? And are these larger cosmological questions also related to the electric circuitry of the universe?